India is classed the worlds most depressed country but the fastest growing large economy in Gross Domestic Product (GDP) terms. Bhutan does not rate well for GDP but measures highly on the basis of Gross National Happiness (GNH). Each country argues its approach is better for society. One influential economist is questioning if GDP is still the best measure of economic growth. By Pratik Vhatkar. Hobart, Australia, October 18, 2018. There are various ways of measuring economic growth but the most common is Gross Domestic Product (GDP), along with real GDP, and Gross National Income. It measures the entire economic output of a country and takes into account all goods and services produced for domestic and international sale. Today, this definition of GDP becomes very complex, due in part to the fact we have seen a big shift in global trends of consumption since it was first adopted widely following a US Congress report in the 1930s. But Kate Raworth, an English economist, has reservations about using GDP as a continuing growth model. She wants to divert from the traditional understanding of success which sees GDP measure economic growth. Her new theory, titled Doughnut Economics, highlights a need for balance between quality of life and environment for a thriving and inclusive economy. Kate Raworth recently gave a seminal lecture at TEDx, asserting that economic theory is centuries out of date. 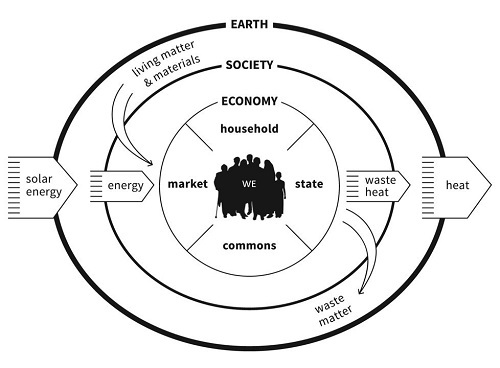 Raworth, who now works with both Oxford and Cambridge universities in the UK, was studying the indicators of a thriving economy when she realised the diagram she drew was doughnut shaped. In her Doughnut Economics model, the innermost ring consists of the resources required to lead a good life: the social foundation. This includes things like housing, food, water health, education, and so on. The outer ring of the doughnut represents the earth’s environmental limits, or as Raworth describes it: the environmental ceiling. And she has set out to change GDP thinking, as she puts it, “one doughnut at a time”. Raworth is concerned that economists today are blinkered by a focus on growth at the expense of other vital factors which build a thriving, inclusive economy. Raworth believes that the goal of economics should be “meeting the needs of all within the means of the planet,” and points to a need for economic frameworks which can “make us thrive, whether or not they (make us) grow”. She maintains that if we find ourselves falling below the social foundation towards the centre of the circle, quality of life rapidly degrades. And, she says, if we shoot beyond the outer, environmental ring we are at risk of creating catastrophes such as climate change. The space between these two rings is the “ecologically safe and socially just space” where she says economic theories should be aiming to deliver us. “We learned almost nothing last century, but what we did say was that economists … were given too much status,” she says. Further, she believes the current economic growth model favours the economically stable by channelling resources and wealth to them. She maintains that the “economy needs to be more distributable”; that systems and governments must prioritise the distribution of resources to ensure an adequate balance of social and environmental needs with economic growth. If the economy does become more distributive as Raworth suggests, we need a way to measure this that factors in social and ecological data better than GDP. Raworth is not the only one looking at the relevance of GDP; Credit Suisse, a large investment bank, has come up with several new datums which it claims have the ability to be a valid a global benchmark. These include Sustainable National Income, Genuine Progress Indicator, Adjusted Net Savings (which accounts for gross savings, consumption, expenditure, and resource depletion as well as CO2 and particulate emissions), Human Development Index, Inclusion Development Index and a Happiness Index. But all have some flaws. Raworth’s model on the other hand considers social foundation as a key factor; indeed many countries accept a variety of indicators of welfare and wellbeing. According to some researchers, the longest running and most accepted welfare and wellbeing indicator is the Human Development Index. This model has been taken up by 177 countries worldwide, since 1980. This measure takes into consideration GDP per person, spending on health and education, and also life expectancy. There are also some newer models like Happy Planet Index which has been adopted by 153 countries, but this has only been in use for the past three years. Countries like Australia, USA and Bhutan have adopted individual models to measure welfare and well-being. Bhutan used Gross National Happiness as indicator for the nation’s welfare and wellbeing in 2010. This approach has received much attention from the international media. It seeks to understand social foundations and environmental ceilings, and is one approach which indicates that Raworth’s Doughnut Model may not be as dramatic a change as it seems. No matter which model, there seems to be no denying there is an urgent need to upgrade our understanding of economic theory and GDP. And to ensure our models reflect real social and environmental benefits as well as simple buy/sell measures, be it Raworth’s Doughnut-based or others. We need to ensure social and environmental welfare for a thriving economy, or some of the the various alternative methods we have seen to measure wealth and growth of a nation – not just product ratings. Raworth, who describes herself as a renegade economist, is keen to push economists and world leaders to think seriously about alternative benefit ratings. And she is not the only one flagging the need for change. Newer PostElectric Scooters: Boon or Bane?